Figure it's time for an update regarding the print show I have a role in organizing. Mary continues to work hard on all fronts on behalf of the show, and one of my tasks is to keep her from getting too excited and making the show too big. She's been seeking sponsors, as we had been told months ago that our NJ gallery would expect some money in exchange for the show, which could come from the participants or an outside source. Rather than make it all from the artists, Mary has been looking for outside money and opportunities. Got one good sized grant last year, and she's also trying to arrange things with suppliers. One offer from a western print supplier may be almost too big, so a bunch of us have pushed her to rein that one in a bit. Today she mentioned another one, a possible demo involving two big time art suppliers and right here in our local space- sounds promising. One way I plan to help is to set up some woodcut classes there at Belmar, something I have done several times over the years. Since most of our members (and most artists for that matter) have no printmaking experience, it was always assumed I'd offer a few sections of my woodcut class, so those who might want to participate can learn the medium enough to actually make something. And this is needed, as there aren't a lot of places around where you can actually learn about printmaking or how to do it. So today I stopped by Belmar and tentatively scheduled a 4 week class for the spring. I may also try to set up one for the summer. As always, these are dependent on people signing up for the classes, but I've been talking up the possibility for months, and once I have it all set, I'll put the details up here. A few weeks ago I received an e-mail from my college friend Jenny, thinking about taking a ride up this way for he occasion of President's Day weekend, a three day weekend for most working people. In my case, I don't currently have a regular job on Mondays, so it's an ordinary weekend for me. Which meant I was available. I guess for her 3 day weekends are rare and need to be taken advantage of. She had two main reasons for taking the trip up from Virginia. Officially she was doing it to claim and pay for the two boardwalk prints she had ordered from me following her visit over a year ago, to see my show at Ocean County College. Unofficially, a major lure to this area for a lot of my college friends is the chance to eat pizza far above what is available where they live. There was a threat of snow, but she decided her and her party were feeling "adventurous" and decided to take the trip. Last night overnight in Hershey, PA, then this morning drive to Ocean Grove. The show I had last year (which ended up running for 3 months) was several of my prints, including a bunch of my boardwalk prints. She had purchased one the year before that on a previous visit, and seeing the set again, wanted two more. So this past spring when my schedule was not too full, I pulled copies of the ones she wanted- the tattoo studio and the boardwalk food. I colored them over a period of time, wrapped them to keep them safe, and took them home. Besides my art and local pizza, Jenny and her family have a fascination for some of the local towns, particularly Ocean Grove and Asbury Park. On her first visit a few years ago, she and the family took a wrong turn approaching and ended up in Asbury, up near the old Casino and Carousel House. They were very impressed with the derelict but still interesting buildings. When she came for last year's visit, the day before the opening we spent time walking the Asbury boardwalk, from those buildings to Convention Hall and back. In e-mails of the past few days, she mentioned a desire to walk from the Studio up to the beach and boardwalk, and to see Ocean Grove's Tent City, just empty platforms this time of year. When I heard from her last night, she said they had made it to Hershey, and would call in the morning as they got closer. And that's what happened. I got up to my Studio early in the noon hour, just ahead of them (husband and mother also on the trip). First I unrolled, signed and stamped the two boardwalk prints. She gave me a check. But then I threw in a bonus. Looking for something else last year, I found I still had two copies of my international For Love Not Money postcard. This was a big collaborative project from several years ago- printmakers used prints to create a postcard of a specific size for international mail, send it by mail to a randomly chosen collaborator, who also mails the first artist a card they started. Both artists then add more printed elements to the received cards, which were then sent to the regional coordinator, who got them to the overall organizer who sent them to Tallinn, in Estonia, to be part of their print Triennial. Since I was in the midst of my boardwalk series, I decided to make that the subject, and ended up making an image based on the Asbury carousel house. My print simplifies the building, takes out the casino, and adds a very boardwalk style pier and ferris wheel. She was very happy to get one now. With that business done, I gave everyone a tour of the Studio building, in better condition than the carousel house, but also a very old, unique bit of architecture. This past year we've had a record setting winter (cold) affecting both our states, but it had been milder this week, and should be next week. But for one day today, back close to freezing. Still, the snow would hold off for a while, and so we took our walk. Walked up Main, took a lateral side trip to the Great Auditorium and the Tent City, and up toward the beach. The town of Ocean Grove is still pretty much owned by the Methodist church (you can own your house, but you still pay rent on the land) and the tent city is a result of the camp meeting movement. Each comes with a raised platform and an attached shed, which includes a bathroom and kitchen, and in winter the tents are stored there. As we get close to summer, the tents will go up on the platforms. For the privilege of living in one of these for the summer, you pay several thousand, have a lot of restriction, and there's a 10 year waiting list. Jenny found the story fascinating, and wanted to see them again, so we did. All in all, a substantial walk. So now it was a little past two, and time for pizza. 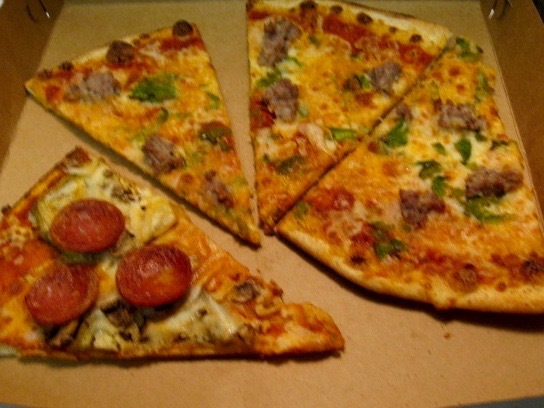 On her last trip, with two days available, she tried two different pizzas. She liked one place a little better than the other, but chose the lesser place this time. Both have eggplant as an optional topping, but she preferred the eggplant at Vic's so that's where we went. Our timing was perfect- a big party was just departing, so there was sufficient parking and plenty of empty tables. Nice rolls on the table, we all got beers, shared a nice salad, split a couple of large pizzas (the one with pepperoni also had eggplant), a nice relaxing meal. Since the rest were going back to their hotel tonight, I was bequeathed the few leftover slices. On the way home from there, it was decided to stop at a bakery (one of the place we stopped at on last year's trip), not that any of us were capable of more eating at that point. And I guided them on a driving tour of Asbury's boardwalk while we still had some daylight left. But it seemed a good idea to end things and get to shelter before the expected storm, so they dropped me off back at the Studio building, where I picked up something from my space, got my car, and drove home, all while it was still dry. There are a few holidays always celebrated at Studio Arrabbiata. One of those in Mardi Gras, because they appreciate the spicy food there. 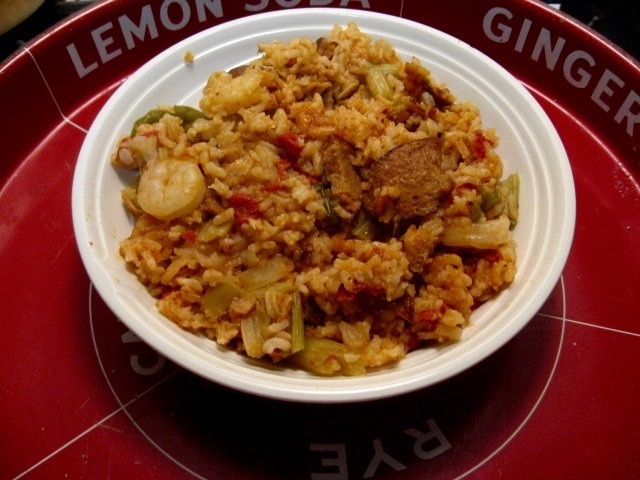 And it has been my custom in recent years to make a nice batch of jambalaya for the occasion, and feast while we can. There used to be a good jambalaya at a Cajun restaurant in the town I lived in, but it closed years ago. Actually my favorite dish there was the crawfish etoufee, but I haven't figured out a good recipe for that yet, or found a ready source of crawfish. Meanwhile, every supermarket in the area has all the necessary ingredients for jambalaya, and there was a recipe for a Caribbean style chicken and pork dish that I had learned that wasn't that far away. Researching various recipes, I found that there were so many options, there was no definitive recipe- a rice dish that has some pork (jambe from the French) so I could create my own. And I find it tasty. Since two of the three days after Mardi Gras are meatless Lenten days, I usually make it early and eat it through Fat Tuesday, so tonight's dish (shown above) was technically a leftover, but often leftovers are tastier than the first time around. With all the vegetables, meats, spices, etc, that sounds about right. Back in the fall I had a number of higher ups in BelmarArts ask me about the possibility of a printmaking themed show. Perhaps because I was coming off having 6 paid students in my summer woodcut class there, some of whom seemed very determined to take it. However, I saw one potential problem- there just aren't a lot of printmakers out there in the region, and we might not get the numbers we need to have a decent show. 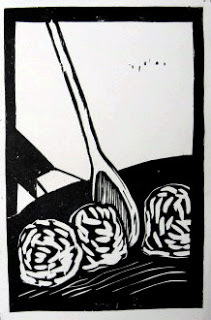 But then Mary Lane, one of my former Belmar students and now ardent practitioner of woodcut, approached me with an idea. Woodcut had not only given her a new way to practice her art skills, but it had allowed her to reconnect with friends from her art school days, now regular printmakers. One of those friends is based in Portland, OR where she does large woodcuts, and she invited Mary to come visit, meet some other professionals, and help her to hand print some 12 foot long woodcut prints, with hand printing being a skill she did as part of my Belmar class. She indicated she had a good time. So my former student Mary and her friend from Portland (also named Mary so we have taken to referring to her as "west coast Mary" came up with an idea- join forces and use the numbers there and here to put together a decent sized show of traditional printmaking. I'm sure woodcut will be well represented, but traditional forms of intaglio, lithography, and silkscreen will also be allowed. I sounded out Rebecca, then director of BelmarArts, and she loved the idea, and assigned us an exhibition slot for September of 2018. Then things got complicated. West coast Mary told us that she would love to participate in a show, but had no time to organize things in her part of the country, or to seek a venue for it out there. Rebecca decided to take a full time job, and left in January. The Board turned over and they are in no hurry to tell us who is running things now. A few weeks ago I received an e-mail from someone acting on behalf of an 'exhibition committee' with a lot of questions about the show. (all of these questions had been settled the year before in our meetings with Rebecca, so I knew it wouldn't be that hard to answer them) Stuff like that. So even though the show was many months away, we got to work. Our Mary has been a dynamo, already securing one significant donation toward our efforts, seeking more cash and/or materials and services from print related businesses, putting together a list of potential artists, both here, Portland, and other regions where she has friends. (for organizational purposes, this will essentially be like a juried show and people who live anywhere can enter) She also produced a written response to all those questions, so this committee can know what we already knew. If that's not enough for them, they'll have to tell us what they really want. Woodcutters don't get pushed around. Our critique group hasn't met for almost a year. Some of our regulars have moved away, people get other responsibilities, etc. Last time I officially scheduled one I was the only one who showed up, so I did some stuff there in my Studio and then went home. But occasionally I get word that people miss it and want to have it start up again. Many students fear critiques, many students and artists can't handle any criticism at all, even if it is surrounded by praise, and so they stay away as much as possible. I have long held the view that if you can't handle people expressing their views about your artwork, you probably need to get out of the business, and a good critique is a useful tool for artists of all levels. Which kept a lot of our regulars coming for years, often traveling long distances to get there. The last person besides myself to come to one was Mary, my most frequent woodcut student in Belmar, and she offered to host one at her home a short distance from the Studio. Had some food, too, so we could have dinner then talk art. I got word out to many of our regulars, and asked Molly to send word out the regulars on her list. The only responses I got were negative (though one asked to be kept on the list in case he could make it next time) so I guess I wasn't too surprised that was just Mary and I showing work tonight. 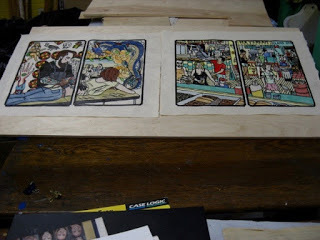 Mary had a few woodcuts in progress, and I brought last summer's St Georgia print, since it has never been exhibited and few people have seen it. I didn't get around to taking any photos of the evening, but it was a pleasant time, making us all hope we can get the critique group back off the ground someday. Wasn't expecting to be back here in this idea so soon, but events continue to evolve. For this story, we need to go back a few days, or even a few decades. There was a time when it was common for people who could afford to do so to get a new car every year or two. I am have never been one of those people. I've been a car owner for close to 30 years, always having one, never having two at the same time, and currently on my third, so I've averaged one every 10 years. My current vehicle is a 2008, so later this year it will be 10 years old, but I hope to keep it going well beyond that. One thing that people who tend to keep cars longer have to deal with that short time owners don't, is that eventually headlights, like any other bulb in the world, can burn out. My first two cars both lost at least one headlight, which I only realized when a police car would pull me over to inform me. Just warnings luckily. I've lived in places with lots of street lights and missing one headlight was not as noticeable. For that reason I didn't mind getting pulled over, even appreciated the information so I could deal with it. Getting around with one headlight is not hard, but when your down to one, if something happens to that one, then you got worry. Anyway, a few days ago I was at my parents' house, arriving in the afternoon, but left at night. Parked right behind my mother's car, and when I turned on my headlights before pulling out, the light shining on her car didn't seem right. When I got to the next location, I left the car running while I ran out to check, and sure enough, my driver side headlight was dark. There was enough street light to see my way home, and enough other lights on the car that I felt there was no danger of not being seen, but this had to be dealt with soon. When I lost headlights in my other vehicles, I replaced the bulbs myself, but it isn't always easy. Car designers often have many demands to meet, and convenience of drivers may be low on that list. Lost both headlight bulbs on my first car, and getting to them required extreme contortion of one's hand, reaching down into the engine compartment, twisting, extracting the bulb, disconnecting it from the wiring, plugging in the replacement, carefully inserting it back into the slot without breaking it (or even touching the glass), and locking it into place. Only had to replace one on my second vehicle, all done from the outside, just a matter of taking out a lot of retaining screws, and making sure I didn't lose them before I put the replacement piece in. The owner's manual for my new car gave the instructions for replacing a bulb- 8 steps, including removing something from the engine compartment first, and since his happened on a Saturday night, I couldn't get the part if I knew what it was, and I thought it a bad idea to do it in the rain, which ended up falling for 2 days straight. Decided the best plan was to wait until Monday and just see if I could get it done at the dealer. From what I remembered, many of the customers in the service department struck me as less likely to be able to handle such a task as I was (and I had successfully done it 3 times before in different vehicles so I guessed the mechanics were used to handling it. Stopped by in the morning without an appointment, but they said they could fit it in soon and in about 40 minutes it was done. The $10 labor cost was worth it to not have the hassle. So what does all this have to do with art? In my hurry to get out of the house this morning (had other errands too) I hadn't brought anything to read, nothing to keep me occupied while I was in the waiting room. Did have a sketchbook in the car, so I ended up working on ideas for this St Dwynwen print. As I said last time, I had decided that this would not be part of my Everyman series, so the format that has served me well for several dozen saint prints would not be available this time. Good thing I'm an artist and designer and can do more than just one format. Put some ideas and notes on paper. Nothing I'm going to show here right now, but I hope to start working on a block next week, possibly my contribution to the East Meets West exhibition, a print oriented show that I am helping to guide toward existence in Belmar. More on that soon. If I could just get some official information, this could be my next print. But that's where it got complicated. Like I said, no St Gwendolyn in the book's index, and nothing like the story when I read through all the January 25th saints. Next step, use the internet searches. Before I could even finish typing in all my keywords, it gave an option of "welsh patron saint of love" so I went with that, which led me to stories about St Dwynwen. Those stories included 4 or 5 variations on the saint's name, and an alternate feast day. (looked up all of those in my book- no luck) Learned some history of the saint, including that a church that had been dedicated to her (at the site of one of her miracles) had been abandoned centuries ago and left to decay. And the kicker, one of those stories mentioned that neither the Catholic Church or the Anglican Church officially considered this 5th century woman to be a saint. No wonder she's not in the book. Based on my policy regarding the saint series, there is just not enough proof to justify making her part of Everyman. However, I might consider using the saint and story for a print outside the official saint series. Put some notes in a sketchbook. Don't be surprised if this turns into something eventually.